This is a procedure in which the front surface of the cornea is directly sculpted by the excimer laser. The surgeon prepares the eye by gently removing the surface layer known as the corneal epithelium. This layer regenerates itself within a few days. Computer-controlled pulses are directed at the exposed surface (corneal stroma) to reshape the cornea. Less than ten percent of the cornea is affected, with the deeper layers remaining untouched. The entire procedure takes approximately ten minutes per eye and is virtually pain free. 2. Alcohol assisted PRK -Uses alcohol to loosen the corneal epithelium before its removal. This allows gentler surgery as it avoids the need for scrubbing or scraping to remove the corneal epithelium. This originated from LASEK, and essentially is LASEK but with removal of the corneal epithelial layer at the end of surgery. 3. Transepithelial PRK Uses an excimer laser to remove the corneal epithelium. 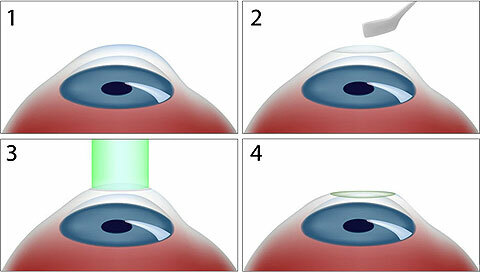 A one step, no touch technique is used where the excimer laser performs both epithelial removal and corneal reshaping sequentially. The LASIK process also uses the excimer laser to reshape the cornea, but is done under a thin, protective, corneal flap. 1. Anesthetic eye drops are applied to the eye. 2. The LASIK surgeon creates a protective flap to access the inner corneal tissue. During this part of the procedure, your vision dims and becomes blurry for about a minute. After the flap is created you are able to see the flashing fixation light of the laser and the bright lights used for the procedure. 3. Next the inner layers of your cornea receive computer-controlled pulses of cool laser light. Although the laser light is invisible, the laser makes a clicking sound as it gently reshapes the inner corneal layer to improve and in many cases, eliminate your prescription. During this part of the procedure, an eye-tracking device tracks your eye movements to ensure precise correction. 4. Following the re-shaping of the tissue, the LASIK surgeon carefully repositions and aligns the flap to its original position. Protective shields are placed over your eye to prevent accidental rubbing as the flap heals naturally and securely over the next several hours.